Ripple In Stillwater: Lawyers, Guns & Money: An Inside Look at the Political Pardon of Frank Vennes Jr.
Lawyers, Guns & Money: An Inside Look at the Political Pardon of Frank Vennes Jr.
U.S. Office of Pardon Attorney (OPA) documents obtained by Ripple in Stillwater suggest that the politically charged presidential pardon of Frank Vennes Jr. went through several unusual permutations of approval and denial as it was volleyed back and forth between the Pardon Office, FBI, Deputy Attorney General and the White House over nearly eight years before it was ultimately recommended for approval in 2008. And, based on the sequence of events outlined in those documents, it appears something happened at the White House regarding Vennes’ pardon petition sometime between April 2006, when the OPA recommended the White House deny the pardon, and Summer 2007, when the White House returned Vennes’ pardon case to the OPA and asked that they “take a second look at” it. 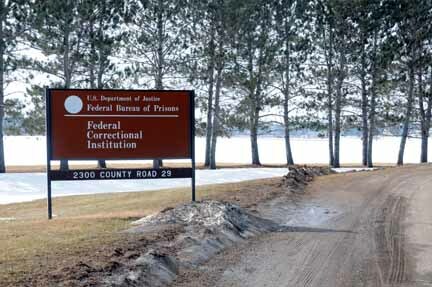 Frank Elroy Vennes Jr. was convicted in North Dakota of money laundering and illegal firearms and cocaine trafficking charges in 1987, served 38 months in federal prison in Sandstone, MN, and a decade or so after his release, began laying the groundwork for a presidential pardon. Vennes and his family were major campaign contributors to presidential candidates Congresswoman Michele Bachmann and former Minnesota Governor Tim Pawlenty, former U.S. Senator Norm Coleman, and state Republican Party entities. Vennes and his family also contributed to Sen. Amy Klobuchar and former State Sen. Ted Mondale, who now chairs the Metropolitan Sports Facilities Commission. Bachmann, Coleman, Pawlenty and then-Minnesota GOP Chair Ron Eibensteiner all recommended Vennes for a presidential pardon during the decade Vennes and his family and personal lawyer showered tens of thousands of dollars on Minnesota politicians. Vennes and his family were among Bachmann’s biggest campaign contributors. Bachmann wrote a letter of support for Vennes’ pardon in 2007, even though Vennes, a resident of Shorewood, MN, and Jupiter, FL, was not and never had been a constituent. Vennes, his wife, brother and sister-in-law already had donated $26,800 to Bachmann’s 2008 congressional campaign when she wrote the letter; Vennes’ personal lawyer, Craig Howse, and his wife had donated another $11,200 to Bachmann’s campaign; and by June 2008, the Vennes and Howse families would pour another $12,200 into Bachmann’s campaign coffers for a total of $50,200. Coleman, who received a total of $16,000 from Frank Vennes and his brother, wrote a letter of support for Vennes on behalf of himself, Pawlenty and Eibensteiner in 2002 to "President George W. Bush c/o Mr. Karl Rove." Rove was then senior advisor to President Bush. 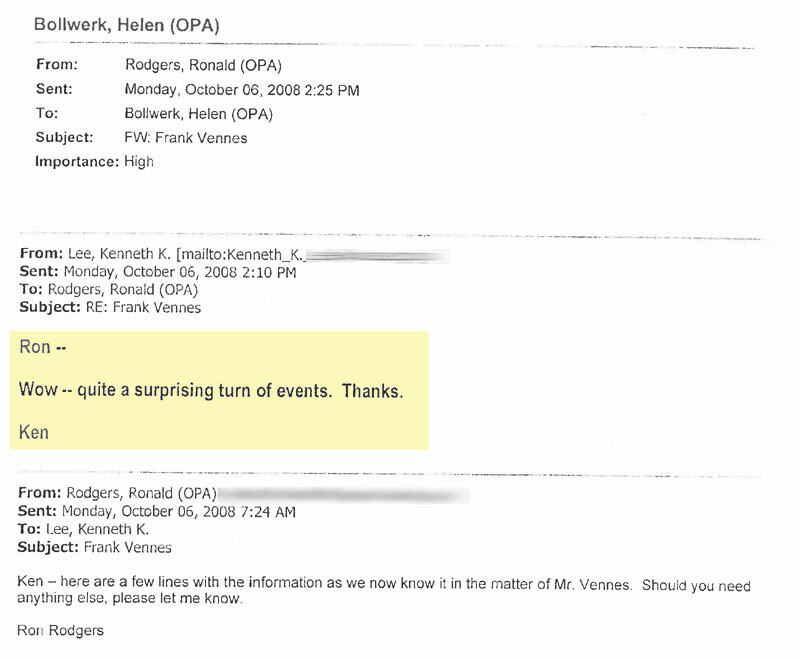 Coleman sent a second letter of recommendation for Vennes to the OPA in 2004. Pawlenty received a total of $28,550 from Vennes, his family and lawyer during his Minnesota political career, and he has other connections to the convicted money launderer as well. Former federal officials familiar with the pardon process who examined documents obtained by Ripple in Stillwater through the Freedom of Information Act confirmed that Vennes’ pardon was headed for approval after it went to the White House for the final time July 1, 2008. But then on Sept. 24, 2008—less than six weeks before the election—the Shorewood, MN, home of Vennes was raided by federal agents in connection with the $3.5 billion Tom Petters Ponzi scheme. Two days later, Vennes’ $6 million Jupiter, FL, home was raided in the Petters investigation. This was not good news for Bachmann, who was in the midst of a tough re-election fight against DFLer Elwyn Tinklenberg. One of her top campaign contributors and personal friends for whom she had solicited a presidential pardon for earlier crimes of money laundering was now implicated in the largest Ponzi scheme fraud in the history of Minnesota. 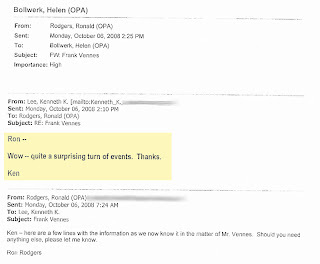 News of Vennes’ alleged involvement in the Petters Ponzi broke Sept. 26, 2008. Bachmann’s office began to move quickly to put some distance between Bachmann and her good friend and donor. By October 2, Bachmann had written a letter to the Office of Pardon Attorney withdrawing her earlier letter of support for Vennes’ pardon. Curiously, she made no mention of the reasons why she had had a change of heart. Coleman, while also engaged in a tight re-election race with Al Franken, never withdrew his letters of support for Vennes. Wrote Bachmann: “About a year ago, I wrote you to share my thoughts on Mr. Frank Vennes, who was seeking a Presidential pardon. I had known Mr. Vennes for some time and was familiar with his good works with local charity organizations. Like so many others, I was under the impression that he had turned his life around and was seeking to do right by those less fortunate. “Regrettably, it now appears that I may have too hastily accepted his claims of redemption and I must withdraw my previous letter … While Mr. Vennes showed public regret, he still clearly needs to reconcile his inner struggles and I am no longer convinced that he would be an appropriate candidate for a Presidential pardon,” Bachmann concluded. Documents obtained from the OPA indicate that this was the first that office—and the White House—had known of Vennes’ alleged involvement in the Petters Ponzi investigation. On Oct. 3, Ronald Rodgers in the OPA sent an email to Kenneth K. Lee, associate legal counsel for the White House who handled pardon applications. 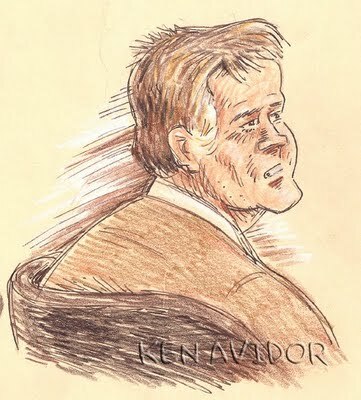 “Ken, this is a pardon case that you asked us to take a second look at and we sent it through the wickets anew and then over to you on or about 1 July 2008 (redacted) no action by the President has been taken on the case. Rodgers sent Lee a link to a September 26 Star-Tribune report on the Petters raid that named Vennes. On Oct. 3, 2008, the OPA also sent a two-page fax, the contents of which are unknown, to Bachmann with the subject line “per your request.” However, the fax wasn’t sent to the congresswoman’s office, from which her pardon letters had been sent. It was sent to Bachmann’s campaign office in Minnesota. That same day, displaying further signs of panic just weeks before the election, Bachmann tried to symbolically wash her hands of the Vennes’ most recent campaign contributions by donating the sum of $9,200—an amount equal to Frank and Kimberly Vennes’ June 30 donations to Bachmann, but only a small portion of Bachmann’s total take from the Vennes and Howse families—to Minnesota Teen Challenge, an organization closely linked with Vennes. That didn’t work out so well for the congresswoman either. Minnesota Teen Challenge returned the donation to Bachmann two weeks later. “We didn’t want to be involved if it was dirty money,” said Rich Scherber, executive director of Minnesota Teen Challenge, which lost millions in the Petters Ponzi scheme after investing with Vennes. Scherber personally suffered a loss of $423,759 in the Petters Ponzi through investments with Vennes, according to court documents, some of which he may recover from Vennes’ seized assets. On October 24, Vennes withdrew his request for executive clemency, the White House returned his case to the Office of Pardon Attorney and the case was “no actioned” and closed. Bachmann went on to win re-election with the Vennes’ substantial financial support and barely a mention of her close relationship with the convicted money launderer and Ponzi suspect in the local mainstream media. Coleman lost to Al Franken in the closest statewide election in Minnesota history. And Tim Pawlenty now is running for president along with Bachmann. But now that Bachmann and Pawlenty have entered the presidential arena, they are facing renewed scrutiny of their relationship with Frank Vennes Jr., particularly since things turned for the worse for the convicted money-launderer last spring. Thirty-three months after his homes were raided and his assets seized by federal agents, Vennes was indicted for his alleged role in the $3.5 billion Tom Petters Ponzi scheme April 20. He pleaded not guilty and was released on $100,000 bond on May 3. His trial on fraud and money laundering charges stemming from the Petters Ponzi is scheduled to begin in February 2012 —right in the thick of presidential primary season. Frank Vennes Jr.’s legal troubles began in August 1986, according to federal court documents. Vennes was charged in May 1987 with multiple counts of money-laundering charges, and illegal firearms and drug offenses that were allegedly related to the missing $100,000. The first firearms offense alleged that Vennes arranged to illegally transfer an automatic weapon from an acquaintance to a federal agent; the second involved the illegal sale of a firearm to a Mexican national who subsequently took the weapon out of the country. The cocaine trafficking charge was related to the use of interstate telephone to facilitate the sale of cocaine. Vennes pleaded guilty to one count of money laundering and no contest to the firearms and cocaine charges. The remainder of the money-laundering charges were dismissed. He was sentenced to five years in prison—three years for money laundering and one year each for the firearms and drug convictions—and restitution of $100,000, which later was reduced to $50,000. Vennes served 38 months in the Federal Correctional Facility in Sandstone, MN, was released in Dec. 12, 1990, on parole, and completed his sentence Sept. 25, 1992. According to a judicial opinion from the 8th Circuit Court of Appeals, Vennes testified that at the prompting of undercover agents posing as Chicago businessmen in North Dakota, “he made two trips to Switzerland to launder money provided by the agents. Vennes successfully laundered $100,000 on the first trip, but on the second trip, associates of Vennes made off with the other $100,000. Vennes appealed the District Court’s decision to the 8th Circuit Court of Appeals and lost, and he was denied appeal to the U.S. Supreme Court. Vennes claimed to have found God in prison, and played that card on many occasions. When he was released in December 1990, he moved to Minneapolis, started Metro Gem, and built a successful business dealing in precious stones and rare coins. Along the way, he became involved in prison ministries. In May 1995, Vennes began doing business with Tom Petters, through whom he eventually would make tens of millions of dollars in commissions for steering investors—many of them evangelical Christian groups and investors—to Petters’ Ponzi scheme. Three years later, Vennes began to lay the groundwork for his presidential pardon: cultivating Washington, D.C. power brokers, currying favor with Minnesota politicians by making hefty campaign contributions and eventually, soliciting them for letters of recommendation. Vennes’ first foray into politics was a $2,000 contribution to Ted Mondale’s gubernatorial campaign on August 28, 1998. Mondale joined the Petters Group as an executive vice-president in 1998 also. And, according to a top Washington lobbyist who wrote Vennes’ first letter of recommendation for a pardon in 2000, it was through Ted Mondale, who worked with Vennes, and the connections of his father, former Vice President Walter Mondale, that Vennes first sought assistance for his presidential pardon. In Part II of "Lawyers, Guns & Money," Ripple in Stillwater lays out the political and money timeline of the Frank Vennes Jr. pardon. Amazing work...why haven't the local papers covered this? You have outdone them all with great research andnwriting. I doubt there's any partisan bias on this one. Bachmann has been getting hammered on this in national news and it seems there are attempts to draw the Pawlenty-Vennes connection as well. Besides, it's important to remember that even higher-up state level politicians have schedules with constituents and party supporters that would make anyone's head spin. Governors, US Senators and Congressmen & women can be exponentially busier in this respect. I've personally witnessed how busy Mr. Pawlenty stays and I would wager that by casting a net over so many people that snagging a bad apple like Frank Vennes is a hazard of the politicking trade. Bottom line: Unless these Bachmann or Pawlenty were truly chums with Vennes, I'd give them the benefit of the doubt in saying that they were probably not yolked with him. How much face time (if any) did he actually have with them? Now when it comes to writing pardon requests... there should be greater accountability for those politicians who would sell those for campaign donations. Despite my distaste for Bachmann and Coleman, I don't doubt that Vennes conned either one of them; it seems he had been building a wave of support since 1998 that was designed for this very purpose. Nevertheless, the sale of a pardon request to such a man as this is inexcusable in my book. Well written article. I look forward to part 2. The thing here is that Vennes and Bachmann and Petters were quite close. Can't speak for Ted Mondale, but AFAIK Klobuchar didn't push for a pardon. At Peter...campaign contributions are one thing, and a long time advocacy for a pardon is another level, we agree on that...but on even on that lower bar of not knowing all about all your contributors is far from honestly self correcting an innocent mistake. First, this Vennes situation has been a big worry for her for some time, so no excuse not know about it and all the stuff swirly around it. Still, she only gave away the money directly from Vennes, not the other obviously related money...it's not like at the time she was a Presidential candidate, she would be a horrible at politics (and no one accuses her of that) if she did not know who her top 30 donors were and some knowledge about their wives and their business associates, groups they traveled in. But the reaching to work so hard to pardon a guy not even from your district, what is that about if not money? Would she have worked so hard for it if he was just a regular, supposedly church going guy from another district? And the rumors and stench coming from Petters and Vennes long proceeded the actual public confirmation of a Federal investigation. A Fed investigation takes a long time to get started, and takes a long time to do and there were lots allegations swirly before FBI got involved....so if you are a politico, get backdoor rumors everyday but claim to be ignorant of even a hint of the Vennes and Petter scandals, I'm supposed to believe that when people a lot less connected than a congresswoman heard things were amiss long before FBI moved. Bachmann always plays innocent stupid, like saying the farm subsidies went to her father in law, it was his farm, she got nothing even when the issue was publicly raised since 2007 by This blogger, later by others, and she has filled out her congressional disclosure sowing income from it, and had years to get up to speed on the details of her own financial life given the obvoious hypocrisy of a staunch Tea Partier taking govt subsidies, especially when already being quite financially set. And yet just this last month she was still lying about it, saying she didnt get a dime. No she ismnot that stupid, not that busy, not that disconnected from her own affairs that she does not know about a financial arrangement she had with her father in law and the income from it in a controversy that has been dogging her form years. She is straight up lying, just as she makes things about her past. Sorry when it comes to scandals that have been stewing for years but not highlighted by locks media, she can't play the innocent stupid card, or the "busy" card anymore. Now this business about Bachmann "playing stupid," I don't think she's just playing (have you ever watched some of her candid interviews?) As it concerned anyone without access to verifiable information, you can't hold them accountable for rumors they may or may not have heard. Now the bigger issue at hand: This pardon nonsense. I disagree that this is a partisan issue; it's neither a Tea Party, nor a GOP, nor a Democrat issue. This is an issue of individual character and integrity for any one of the politicians caught up in this. The details relevant to the Bachmann pardon issue that you point out are straight to the point: Vennes is not from her district and he happened to have been one of her largest donors. This may have afforded him face time with Bachmann, but how are we to know? Did she meet him? Has she known him for years? I would really like to know on what basis she justified writing this recommendation because my suspicion is the same as yours: I think it was a business arrangement. An important issue here is that we're left with little verifiable information and it becomes easy to fill that void with assumption, suspicion and conspiracy theory. I appreciate Bremer's integrity in writing this article because it lays a fact-based framework without indulging in wild speculation. Many of the details herein have been underreported altogether. Hats off to you, Mr. Bremer. One of the cool things about about Norm's letter is that he wrote it on Senate stationery before he was sworn in. Pretty awesome. You really did a swell job in reporting the Political Pardon of Frank Vennes Jr. This article is even better than when I read it in the newspaper. Kudos to you and the fact finding team. Thank you very much for sharing this, It is different from what I've heard. Your article is very informative and it answered all of my questions. Thank you very much. This is a very shocking news. I really hope the man should get jailed. I hop everyone learned a lesson on this tragic news. This story of Frank Vennes is an eye opener on transactions by the Pardon Office, FBI, Deputy Attorney General and the White House. The people in this institutions should not make hasty decisions involving a formerly convicted person. This letter of recommendation residency will be used when the person applies for a new position at a different institution and it will assist that person in proving his ability and the fact that they are qualified to be considered for that the available position. I assume that this form of post is very shock completely from us. It’s my contentment to study your post. it's miles very enlightening and stirring and most one-of-a-kind submit of my lifestyles and desirable work and maintain it up thanks.